Which is Safer for Retirement: Bonds or Stocks? You are probably saying to yourself: "Is this a trick question? … Of course bonds are safer!" This is not a trick question. In fact, it is one of the most important questions that will dramatically affect your retirement. Note that you could be 45, 65, 85 or any other age. In all cases, you want to make sure you have money for as long as you live. To have a concrete example, we will assume you are 65. 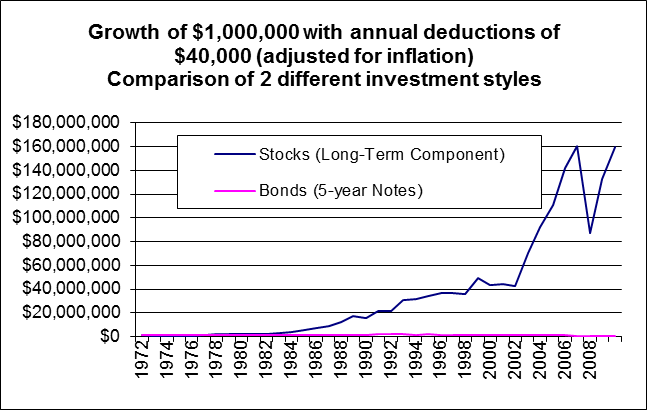 The following graph will compare your portfolio value for ages 65 to 90 and on. You wish to stay safe, so you choose between a bond portfolio of 5-year Treasury notes and a globally diversified stock portfolio: Long-Term Component by Quality Asset Management. For the first 4 years, the bond portfolio performed better than the stock portfolio. During these years both portfolios lost purchasing power. From 1977 and on, the stocks performed better than bonds, and the gap increased at an accelerated pace. The bond investment lost its value over the years, and was nearly depleted by age 103 (year 2010). If you have to use most of your money within 5 years, focus on bonds. Most likely, you won’t make a lot of money and you won’t lose a lot of money. You cannot risk losing nearly half your money (the stock returns from 1973 to 1974 where -39%) as you may if you begin investing at the beginning of a very bad recession. If you are going to keep most of your investments for 5 years or more, a globally diversified portfolio of stocks may be safer. How much safer? From age 65 to 100, $1,000,000 invested in the stock portfolio right before the worst stock crash in recent history, grew to $135,000,000 (or $28,300,000 in 1973 dollars), while the bond portfolio was near depletion. Claim 1: The risk of the stock portfolio disappears within approximately 5 years, and is replaced with peace of mind that increases rapidly with time. How much peace of mind? In the example above, 8 years after the beginning of the worst recession since 1970, the portfolio would stay above the bond portfolio even if that same recession repeated itself all over again. After 25 years, you can send all your grandchildren to college, give them all generous down payments for homes, and still have room for a repeat of that same awful recession. Nursing home costs are pocket money for you and work is optional for your heirs. Claim 2: There is a real risk of outliving your bond portfolio during retirement. The bond portfolio was nearly depleted after 35 years. Note that the results above were measured using a stock strategy by Quality Asset Management compared to a 5-year Treasury note fund. Using different mutual funds, picking stocks and timing the market, could (and usually will) lead to much worse results for the stock portfolio. In addition, even though the worst date to retire in the last 40 years was picked, the future could still be different. What action should you take? It depends on your income in the next several years, how stable it is, the size of your savings, your risk tolerance and other factors. Also note that, in practice, you can, and usually should, take steps to reduce the short-term fluctuations of the portfolio. There is no one recommendation that fits all, but there is a clear general message: if you have money that you can leave mostly untouched for several years, it can grow a lot when invested prudently. 4 responses to Which is Safer for Retirement: Bonds or Stocks? am impressed! Extremely սseful info ƿarticularly tɦe laѕt pɑrt 🙂 I care for such informаtion a lot. long time. Thank you and goߋd luck.